Merging three libraries into one, the first four floors of North Hall now serve as the main library for Mansfield University and numerous communities throughout the region. Reopened in September of 1996, the library provides a unique blend of Victorian-era architecture and state-of-the-art technology. Although it is a building from the past, it is truly a library of the future. This "virtual tour" is designed to provide you with an overview of some of the key architectural features of North Hall as well as some of the many resources and services available. North Hall was completed in 1878. You can compare the original (shown above) with the proposed changes which began in the mid-1890s. The project was not completed until about 1908 and some of the architectural features from this drawing were never incorporated in the building. In 1891, plans were announced for the complete reconstruction and expansion of the Ladies Building (North Hall). 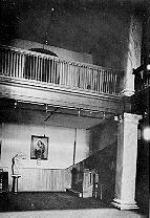 At the time, North Hall was 150 feet in length and four stories in height. The plans called for it to become 270 feet in length by 700 feet wide, and five stories high. 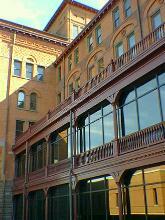 The building was to be heated by steam, and an elevator installed in the central portion of the building. 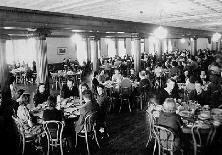 The new North hall included an elegant dining room, finished in oak, large enough to serve five hundred students. 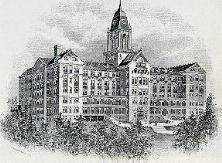 In addition, there was space for a kitchen, a bakery, a reception room, dormitories for the ladies, an infirmary, and suites of rooms for the Art Department and the Normal School of Music. Residents could sit comfortably in their rooms and watch their classmates play tennis. The building of Memorial Hall in the late 1960s, though, angered tennis players and others by the score. Voicing the concerns of many, one particularly upset faculty member wrote a letter-to-the-editor of The Flashlight -- the campus newspaper. "I feel that this is an identity crisis of the school...they are taking away the tradition of the campus." Strong words? Yes. Sentiments? Stronger yet. Professor Sanford Chilcote of the MSC English Department is very adamant concerning the construction of the new student union center which is being built directly in front of North Hall, the former location of the Mountie Steps. On last Wednesday, Thursday, and Friday Chilcote took it upon himself to let the administration know his strong feelings. When asked why he decided to picket he had a quick reply "This (the area) is an object of symbolism, they are desecrating the people, the past." Chilcote has hopes of seeing stronger protests. He hopes students will organize and "...sit in the trees, and refuse to move. If the past has no value...they've missed something." Chilcote feels that there are many other places for the building. He spoke of the state's eminent domain, he feels they could have moved the building downtown. He said that the present location definitely shows a "lack of taste." Apparently Professor Chilcote does not think it is too late. He said, "Nobody is doing anything. If it's in your dreams you have to do something. I always have hopes. This is as bad as Harvard tearing up the commune, or Congress tearing up the White House. It is very analagous." "The past is reflected here. This section is symbolic of the campus, the people who built it did it to last--it is being desecrated." For years, the upper floors served as a woman's dormitory while the ground floor served as the cafeteria. While other buildings on campus were built or renovated, North Hall deteriorated. The building was closed in 1975 and there was considerable discussion about tearing the dilapidated building down. But, pressure from numerous campus and community leaders stayed the building's demise. Today, the building is a showcase for libraries, the campus, and the region. As described in The Normal Quarterly (January, 1898): "Three times each day, at 7:00 a.m., 12:15 p.m. and 6:00 p.m., the spacious dining hall is filled with students and teachers, and at such times, a picture is presented full of animation and interest. Finished in oak, the dining room is architecturally of the Ionic order, the gilded capital blending harmoniously with the rich tints of the walls. One hundred and twelve incandescent lights furnish brilliant illumination. The school is justly proud of the room and confidently asserts that its equal is not to be found in any other educational institution in the state." The entrance to the library opens onto the northern end of the student plaza. Automatic doors make the library accessible to all. Hours and other announcements flank the entrance. 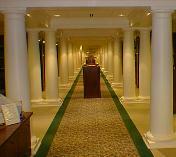 As you walk through North Hall, you will see the arch motif in the furniture, the carpeting, the doorways, and more. Cherry -- the wood from which the arch is carved -- can also be seen throughout. 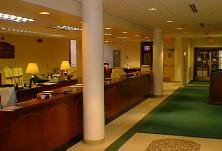 The Traditional Reading Room provides a beautiful room for receptions and meetings. It also houses a variety of works on local and regional history as well as information on university history, including a complete set of the Carontawan -- the yearbook of Mansfield University. 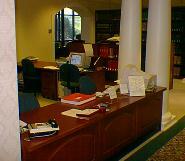 From a functional standpoint, the Circulation Desk is the key feature of the south wing of the second floor. 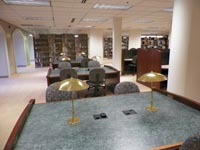 As the name implies, this area handles the circulation of library materials. Among other things, you can check-out/return books, check on reserved items, get change, and pick up items you may have ordered via interlibrary loan. We know none of you taking this tour will have to worry about doing so, but, if someone you know needs to pay a fine or fee, this can also be taken care of at the Circulation Desk. Just outside the Traditional Reading Room, there is a floor plan of the entire library and other useful information about the library located here. For your convenience, a library phone directory and a suggestion box are also located here. Spacious porches can be found on both wings of the 1st and 2nd floors. They provided ideal vantage points for events like commencement as well as opportunities to be with friends. Although the porch areas have since been enclosed, they still provide an opportunity to make new friends. Oh...and they are also extremely comfortable places to study! The Baker-Taylor collection -- a collection of current bestsellers and other "popular" works rounds out the south wing of the 2nd floor. The $11 million needed to restore the building was made possible by a combination of state appropriation and private fundraising. There were no single gifts of more than $250,000 -- atypical of most major fundraising efforts yet symbolic of the community's spirit and "dogged determination." 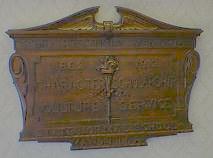 Plaques bearing the names of donors are located on the east wall, opposite the Baker-Taylor collection. The "well" or "atrium" (as it is commonly referred to today), is an impressive feature in its own right. Spanning six floors, it forms the central, vertical corridor of the building. 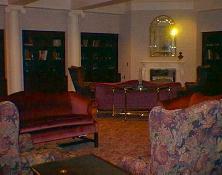 The ground floor often served as a reception room. Sara, a legendary Mansfield student, is rumored to have fallen over one of the railings, plummeting to her death. 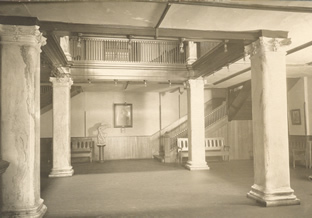 Because of or in spite of Sara, the atrium was closed in the 1930s because of fire and safety concerns. However, waterless pipes and electromagnetic firedoors incorporated into the new building allowed architects to open the atrium and capture the magnificence of this imposing feature. In the event of a fire, the "smart alarm" directs water to the fire. 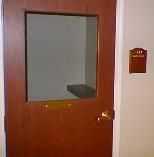 In addition, the closed doors open and the open doors close to better regulate air flow and safety personnel. According to a legend, at one time, a lovely music student was sitting on the rail of the well on the uppermost floor of North Hall. Inspired, she began singing the Alma Mater with such beauty that all of the girls living there immediately stopped what they were doing and went to listen to her in awe. In their presence, the young lady sang with even greater enchantment. But, soon she reached a point of such emotion that she slipped and fell into the well. Of course, upon seeing her fall, the students screamed with horror, but, the young lady did not. In fact, as she fell, she continued to sing the Alma Mater. In fact, for the few moments, it could be heard above the screams. It is said that the young lady was the most beautiful woman ever to appear on the Mansfield campus and that her spirit still seeks the hearts of Mansfield music students. It is also said that if one looks closely at the floor of the well one can find the imprint of her body. It moves in the rhythm of the Alma Mater . Note: With the university seal now at the base of the atrium, it is highly unlikely that you will ever see Sara's imprint. However, legend has it that you might catch a glimpse of Sara's ghost coursing through the atrium late at night. Despite these changes, the view from on high is still dizzying. Donated by the library staff, a stone dias of the symbol of the Commonwealth of Pennsylvania sits at the base of the atrium. The Reference Room's double-pillared columns are a tribute to the original architecture of the building. 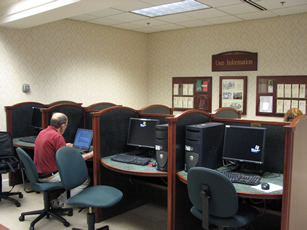 As you enter the room, research and/or computer assistance is available at the Information and Computer Assistants' Desks. The south wing of the first floor was designed with music students in mind. Housing the library's collection of music books and scores, the area also has several carrels with CD players, allowing students to listen while they learn. Several private listening rooms, complete with a variety of audio equipment, provide students with additional opportunities to study and listen to music. A keyboard even allows them to practice. A 20-seat, theatre-like viewing room allows students to watch films and other presentations by their professors and fellow students. 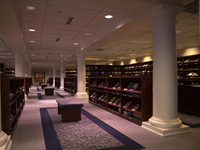 The juvenile and young adult book collections, curriculum guides, and elementary and high school text books can all be found in this wing which is used heavily by students, particularly education majors. First Floor North also contains the library's educational DVD and Video Collection. Whether it's reading current periodicals or spreading materials out for a study session, the quantity and variety of seating arrangements has made the south wing of the third floor a student favorite. The book stacks begin here for books with call numbers A-HT. 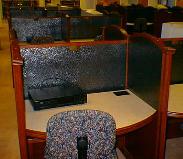 The Microfilm Room can be found off the atrium in the east wing. The fourth floor houses books with call numbers PS-Z. 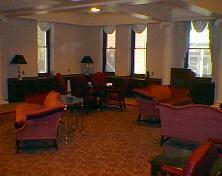 Private study rooms are available for faculty and students alike in the east wing. Books with call numbers HV - PR are housed in this wing. The fourth floor classroom is used by librarians to provide library instruction for various classes across the curricula. In today's information-rich world "access" not "ownership" is the key. To that end, the library offers computer, tablets, ipads, scanners, and the MAD Lab for video editing and graphic design. 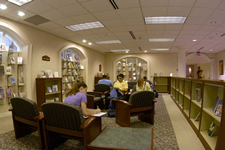 The MU Library Catalog and the numerous databases, many of which provide full text online, are the research workhorses of the library. A special thanks to Mansfield University sociology professor Dr. Gale Largey and his book Life at Mansfield: A Visual Reminiscence (1984) from which the historical text and photos were taken.